The Aegean Plaza offers traditional and unique Cycladic architecture whilst combining all modern facilities at the same time. 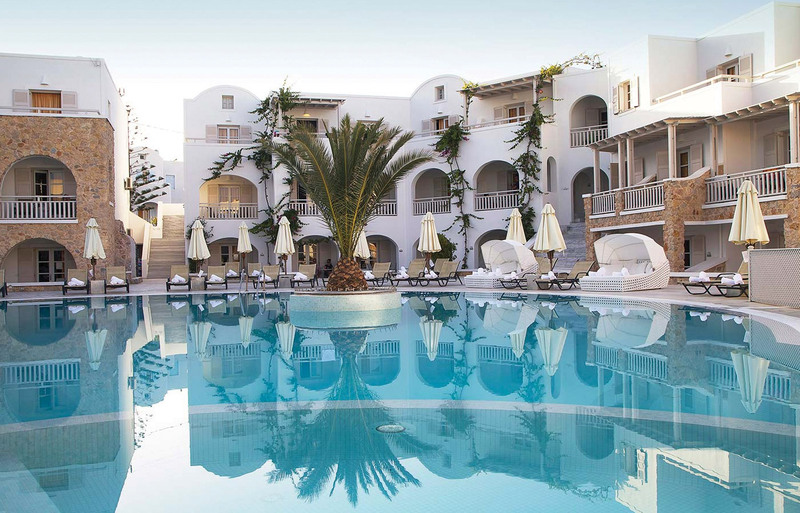 The hotel consists of 120 rooms set in 3 blocks and each block having its own swimming pool. This complex is kept to a good standard by its very friendly staff that are always on hand to assist your every need. The Aegean Plaza is set in an ideal location only 80m away from the black beach of Kamari and this is where you will find many of the mini markets, bars, restaurants and nightlife. Aegean Plaza Hotel is located just 4 km away from the airport, turn right and follow the road to Kamari beach and 12 km from the harbor. 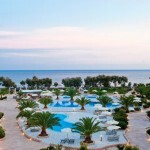 Aegean Plaza Hotel is located 30 m from the beach on the north side. Hotel facilities: 24 hour reception, daily maid service, room service, TV lounge, indoor bar, breakfast room with American buffet breakfast, restaurant, 3 swimming pools (2 with jacuzzi), children’s pool, pool/snack bar, tennis court, small gym, sauna, conference room for up to 70 people, free wireless internet access, internet corner at the reception (on extra charge), money exchange, laundry service. Room facilities: Air conditioning, telephone, satellite TV, safe box, hairdryer, radio, marble bathroom with bathtub, mini bar on request and private balcony or terrace most with pool view.